The Ultreya and AGM is at St Peters Church and Church Hall in Woodhall Spa on the 11th of April. A new location for Cursillo and perhaps more central to us all. The format will be the same. Eucharist, bring & share lunch, AGM and Ultreya. Starting at 12:00and finishing at around 4:00. At the AGM we will need to elect a Lay Director Elect, Secretary, Publicity Rep and a new post a Safe Guarding Officer. Names for these posts please to either Liz or Jeff. St Peters Church and Church Hall are on the south side of the B1191 from Horncastle and about 1/2km east of the roundabout in the centre of the village and opposite the Golf Hotel. Limited parking in front of the hall and plenty on the road. For those who use a satnav you could try LN10 6PU. It’s for the Golf Hotel on the other side of the road!! There has been more than one highlight for Lincoln Cursillo over recent months! On 22nd November we had our second Myers Briggs training day, about how different personality types bump into, and cope with, stress. This was led by the Revs Judy & Chris Craig Peck, who kindly travelled up from the Peterborough diocese, where Judy is the Diocesan Spiritual Director. They did some useful revision of character traits, and we had great fun thinking about how different scenarios affect different people, as well as working through how we might deal with those responses. Then on 16th December Jeff Wilson and I were commissioned as Spiritual & Lay Directors of Lincoln Cursillo by Bishop Christopher. This was a short but very moving service held in the Chapel of The Old Palace, based on wording supplied by BACC. It was the first time our Diocesan Officers have been authorised publicly by the Bishop, and it is difficult to describe just how special that felt to us! I have been in office for nearly two years now, but it was very affirming to have this officially recognised as a recognised ministry within the diocese. You will know that Cursillo can only operate within a diocese with the blessing of the current Bishop, and it was a privilege to receive the right hand of friendship from Bishop Christopher. We hope and pray that the Cursillo method will be recognised as a valid option of deepening our relationship with Christ that others may access during the Diocesan Year of Discipleship. Into January 2015, and the 20th Anniversary of the inauguration of Cursillo within Lincoln Diocese! The first "Declaration of Trust" was signed on 22nd January 1995, by Peter Godden, John Tooze, Lesley Sleight and Stephen Barker. Of course much work had taken place behind the scenes by many people before this document was finalised. We celebrated on 3rd January 2015 at The Old Palace, with many lovely guests from our own diocese and beyond. Our National President, Sally Hanniker-Major, and our National Spiritual Director, Revd Hugh Burgess, came to support us, as well as to lead the morning training session about "Servant Community." (There is a report about this elsewhere in the Imp Sheet.) Also present were representatives from our neighbouring Cursillo dioceses of Southwell & Nottingham, Leicester and York. All the previous Lay and Spiritual Directors of Lincoln Cursillo over the past 20 years were invited to attend, and we were particularly pleased to welcome Hall and Sarah Speers who had travelled up from London. (Hall was SD from 1999 - 2004.) We were also delighted to welcome Revd Stephen Hoy, our Diocesan Spirituality Officer. He gave his greetings and congratulations, especially mentioning our 4th day Rule of Life. We watched our new publicity DVD about Cursillo, produced by Adam Simcox. (www.uncannyfilms.com) This was the first viewing for many people. We continue to wow ourselves with how well it turned out, and pray that it might bear fruit in giving more information about Cursillo, and also in encouraging more Pilgrims to attend an event and continue into the 4th Day of Discipleship. Hugh led our celebratory service of Holy Communion in the Chapel, which was typically joyful! And as for the Welsh harmonies ... ! I was able to share other greetings from people not able to attend, and then followed a time of indulgence in some shared reminiscences, various group photos, and finally a welcome cuppa and slice of birthday cake! All these occasions have reminded me of what a privilege it is to be your current Lay Director, building on the past and hopefully working towards the future. As I have said before, it is God's work, only possible in His strength. Yes, we have survived to see another year! Praise the Lord. As you will read elsewhere in this Imp Sheet, Liz Lilley and I were commissioned as Lay Director and Spiritual Director, respectively, in December last year. I believe that by doing this, Bishop Christopher affirmed Lincoln Diocesan Cursillo as part of the Diocesan commitment to growing in faith, confidence and joy. The occasion was itself a service of dedication to the ideals of both our diocese, and the Cursillo movement. As Cursillistas, we are disciples of Jesus Christ, and as such it is our duty and our joy to proclaim our faith by the Cursillo tenets of prayer, study and action. I was happy that Bishop Christopher chose to commission us in the chapel in the Edward King Centre. As many of you know, it is very atmospheric in the chapel. It always seems that the prayers of hundreds and hundreds of Christian worshippers have seeped into the very walls over the centuries. The Eucharist held in that chapel at the Winter Event in January, continued that tradition of worship with a joyful service, at which the Revd. Hugh Burgess, the National Spiritual Director, presided. Both Hugh Burgess and Sally Henniker-Major (President of the British Anglican Cursillo Council) gave excellent presentations at the Event. I commend to you the Lincoln Facebook page. It's a private Facebook group for members of Lincoln Cursillo. You can just view it to see what's being discussed or you can add your news, photos, thoughts, prayer requests etc. that only members of the group can see & read. It is called “CursilloLincs” and ably administered by Hilary Barrett. In April, I'm booked in for a Cursillo leaders Workshop at Stone in Staffordshire. It is particularly recommended for anyone who has any leadership role in Cursillo, lay or ordained, before or as soon as possible after taking office. So I thought I'd better go as soon as possible. I'm hoping to come back full of vim and vigour, having been suitably informed and refreshed. Seriously though, I'm looking forward to an inspiring spiritual experience. My prayer for you all, this new year of 2015, is to live a Christian life to the full, enjoying the blessings which God provides. One of those blessings is Cursillo. Bishop Christopher undertook one of the less familiar services of his office when he commissioned Revd Jeff Wilson as Spiritual Director and Liz Lilley as Lay Director for the Cursillo movement in the Diocese of Lincoln for 2015. 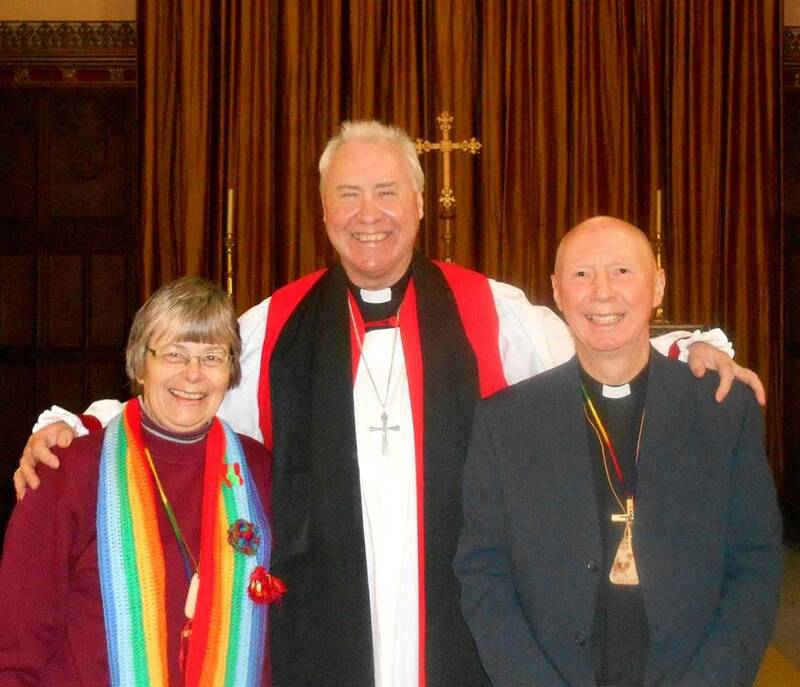 The Bishop commended Jeff and Liz for their dedication to working towards Christian revival in Lincolnshire. He quoted Archbishop Justin Welby, saying that the church cannot be rejuvenated from outside, but must change from within. This rejuvenation, he said, would take place through spiritual regrowth, rooted in prayer and study, such as is encountered in Cursillo. He spoke about each Christian’s lifelong journey, growing and developing in faith, and commented that new growth in the Diocese is rooted in the people it serves, springing from those roots as the diocese grows in faith, confidence and joy. Liz Lilley commented: "It was so encouraging to be acknowledged and affirmed by our diocesan Bishop, something that has not happened at Lincoln before. I was moved to have the Bishop extend to me the right hand of fellowship. Within Lincoln Cursillo we are pleased to be able to provide another method of deepening people's commitment to Christ, especially as we approach the Year of Discipleship together." At our Winter Event on 3rd January, we had the privilege of hearing our National President, Sally-Hanniker-Major, and our National Spiritual Director, Rev Hugh Burgess, talking to us about Servant Community. I had asked for their input because it had long been on my mind that we were not fully understanding this “layer” of service as Cursillistas, which differs from that of Secretariat. Sally began by challenging us to express just why we still want Cursillo in Lincoln Diocese, after 20 years? Reasons included :- to encourage deeper discipleship, an experience of unconditional love, to encourage, equip and support each other in order to act as leaven in the environment in which we live, sharing insights, and as a resource and method for the Church. Who is responsible for the running of Cursillo within the diocese? The “set in stone” members of Secretariat comprise the Lay Director, Spiritual Director, Secretary and Treasurer. (In Lincoln Cursillo the people in these four posts are called the Trustees.) Their job is management and policy decision, and at least one of them should meet annually with the Bishop so as to work with him as part of the Diocesan Plan. They should identify leaders, both for the “Weekends” and for the organisation. Secretariat should model good practice, using the Group Reunion at the beginning of each meeting. They should ensure that Ultreyas are arranged, and support the National Ultreya. They should promote the movement and keep it authentic, keep in touch with the National Committee, set up insurance and safeguarding policies, etc, etc! All this cannot be done by those four people alone!! Remember all the post-it stickers of jobs any of us had done in support of Cursillo?! (Sally was particularly amused at the one that said “Book the pub lunch!”) Other leaders are required to co-ordinate different groups to fulfil all these tasks. We were pleased to be affirmed in our choice of co-ordinator roles – Pre-weekend Rep, Weekend Rep, 4th Day Rep, Publicity Rep, Communications Rep – Imp Sheet and Website, Palanca Rep, and BACC Rep. We have chosen in this diocese to include these Co-ordinator Reps on our Secretariat, in the interest of good communication! So who are the Servant Community? Those who share all these jobs! YOU! I thank God that we have so many active people in our Cursillo Community, who step up to the mark when it comes to local reunions, Ultreyas, palanca prayer support, serving on Team, sponsoring Pilgrims, storing equipment, making badges and crosses, and the 101 other jobs that crop up from time to time! Through reports to Secretariat from the Reps already mentioned, and regular conversations with the Group Convenors, any problems can be talked through, if and when they arise. Sorry this report is a bit sterile! Believe it or not we had great FUN during the morning of teaching! The material I had read previously about Servant Community had implied having separate meetings, where prayer and teaching would be the priority, but also include creative workshops. I now feel reassured that we are actually achieving that, to some extent, at our Ultreyas and our Winter & Summer Events. I would encourage you all to make these a priority in your diaries, so as to be an encouragement to others as well as benefit from fellowship yourselves. Discuss in your reunion groups how these might be improved! It is good for us to meet together, but in a diocese that is so big we must ensure the travelling to do so is worthwhile. I have recently read an article where someone complained about being on her own on Christmas Day and no one inviting her to join them. However, no one knew because she told no one. Once people knew the situation she received several invitations. I have been able to attend both the Summer Event and Ultreya by asking if anyone in my reunion group can possibly bring me back if I get there or take me. Both events had a group convenors meeting before so involved me being there before everyone else. At a group reunion meeting we were all encouraged by Liz to get together and share transport to events. Several people arranged to do this for the Ultreya. However, one driver had to drop out but within 24 hours God had given us another driver and a dog sitter so that everyone could still go. I have learned that I can't sit back and wait for someone to offer but have to ask if I want a lift. I can't expect other people to think about me when they have other things to think about. I remember at my weekend how everybody was so willing to help and nothing was to much trouble for anyone. I therefore do not understand when a Cursillo member says they don't like to ask. On the 8th November, Joy Cheryl and myself set off for the Winter Ultreya at Alford. It started to rain as we arrived, but we found the beautiful church of St. Wilfred’s and had a very moving Communion Service. We passed the bread between us, which I think is the best way to receive the Sacrament, and as Joy pointed out the bread crumbled and reminded us of Jesus' suffering. After the service, when Rev. Geoff told us not to let our halo's get to tight, we went across to the Church Hall. Sadly there weren't many of us attending, but what we lacked in numbers we more than made up for in enthusiasm. Firstly we ate a fantastic 'pot luck' lunch. It never fails to amaze me how everyone seems to bring something different. The sandwiches were to die for (you should have been there!!). Mike gave us a talk on how he came to know Jesus and it was so beautiful it nearly moved me to tears. We then sang our hearts out and clapped our hands all to a backdrop of glorious slides of God's wonderful world. To complete the day, there was a spectacular sunset as we drive home. Both of these were very good events although the numbers were very low. The group convenors meeting in the morning was most encouraging and one of the best one I have attended. I feel that these meetings are beginning to take off now and will be an important part of Cursillo in the future. After a brilliant service in the great church followed by a super bring and share lunch we heard a fantastic witness talk and responses. Both events had so much care, love and fellowship that we all came away feeling we had had a great day. If you were not there you missed out on a wonderful occasion. Life’s journey can be seen as a pilgrimage. As we travel we see and are helped by signs. An arrow or sign post guides us in the right direction. When they are missing we find deep comfort when we find them again. As a pilgrim we need a stick to help support us as we journey. We are encouraged and helped by our travel companions. Who are the people who are walking sticks in your life’s journey? Are you a walking stick? As pilgrims we have a rucksack to carry our things. and how much each thing counts. In your journey through life have you added things to your rucksack? What can you take out, what excessive baggage are you carrying? No pilgrim is free from pain of any sort. We have to learn how to cope with our pain. How do you face the pain of life? Do you have life wounds which need to be dealt with? all meet at a single point. That point which we are all striving to. Are you guided on your way? Who are you guiding through life’s pilgrimage? There are posts marking where we have been and where we are going. Some have been at good times and some at poor times. Which posts do you remember? At poor times who helped or who are you helping? To the God in whose image you were made.